The Tassha Village is a model project site of the agro-tourism promotion program which was proposed by the Aomori Prefectural Government. 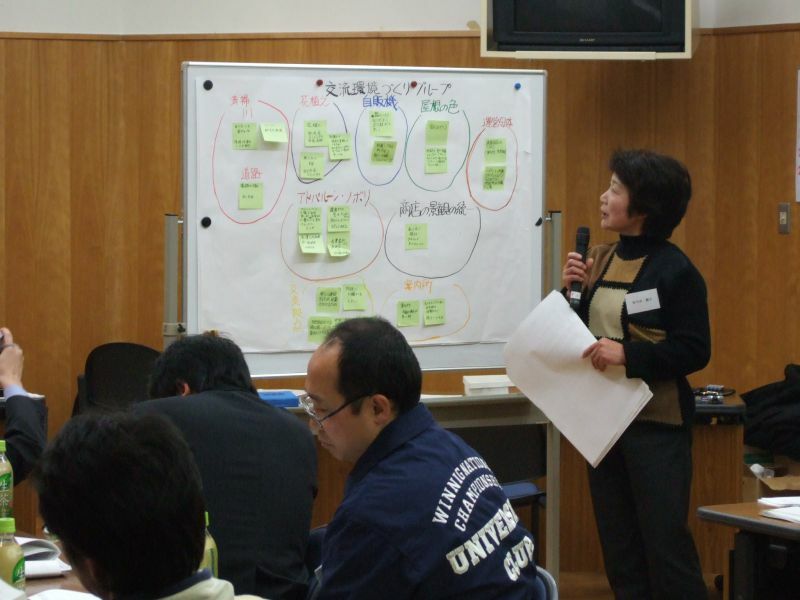 The Nambu local government was appointed as the implementing agency by the prefectural government. Before they started the Tassha Village Project, the local government organized a workshop with local people in order to discuss what activities they could do in their community. The photos below are from the third workshop held in November 2005. In the workshop, the participants, who consisted of local government officials and local people, were divided into four groups and discussed specifically what they could do in the project. The four groups were the hospitality group, the community environment group, the rural life experience group, and the specialty-branding group. After the discussion, each group presented their ideas and shared them with other participants. The specialty-branding group is discussing possible brands of Nambu specialties. The woman is explaining what activities local people can do in the Tassha Village Project. The community environment group presented on the need to improve some shops’ appearances, to set up an information center, and so on. The rural life experience group explained their ideas about hands-on experience opportunities in agricultural work, fishing experience opportunities in the river, walking in the forest, guiding tourists to historic sites, cooking local food together, teaching Nambu dialects, and so on. 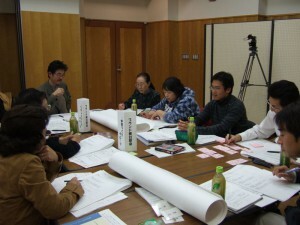 Later, the results of each discussion were examined by the local government, and appropriate ideas were included in the Tassha Village Project when they designed it. The Tassha Village Operation Committee was organized in order to implement the project effectively and efficiently. The committee consists of representatives of the local people. Based on discussions with local people, a lot of hands-on experience opportunities were included in the project. For each hands-on experience opportunity, tourists need to pay. So, by providing a hands-on experience opportunity for tourists, farmers can get additional income. The farmers who were willing to accept tourists for hands-on experience opportunities registered with the Tassha Village Operation Committee. The local government made a list of farmers available for each activity, and created pamphlets and brochures to promote their activities. 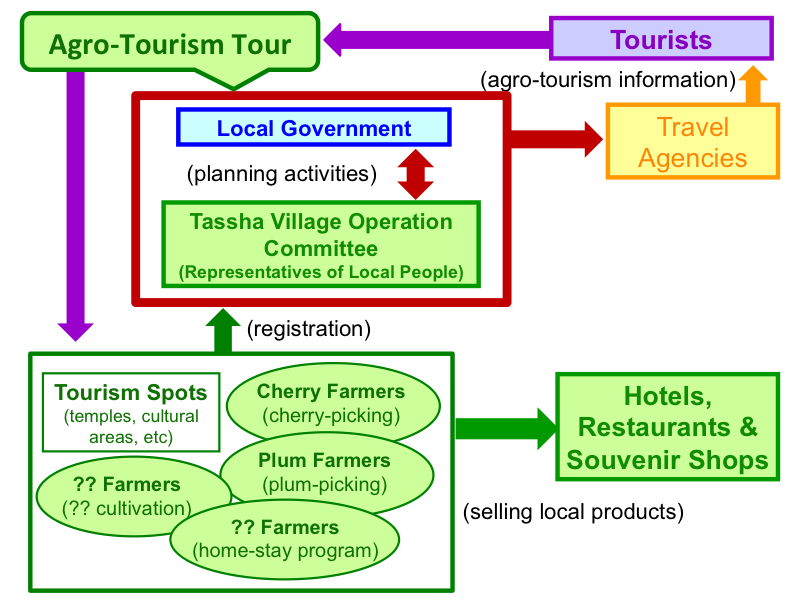 In the Tassha Village, besides the Tassha Village Operation Committee, several community organizations, (one example is the Agro-tourism Promotion Committee), were organized in order to promote Tassha activities. The local government in collaboration with those civic organizations advertises the agro-tourism and coordinates with travel agencies and high schools in urban areas. There is a website for the Tassha Village. 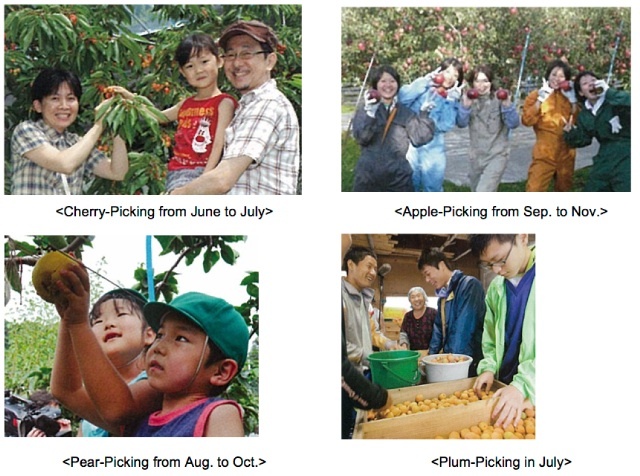 Since Nambu is rich in a variety of agricultural products, they can provide hands-on experience opportunities for tourists throughout the year as shown in the calendar below. In the Tassha Village Project, not only harvesting but also “agricultural care” is included in the hands-on experience opportunities, such as pollination of blossoms, and removing superfluous blossoms to ensure a good harvest. 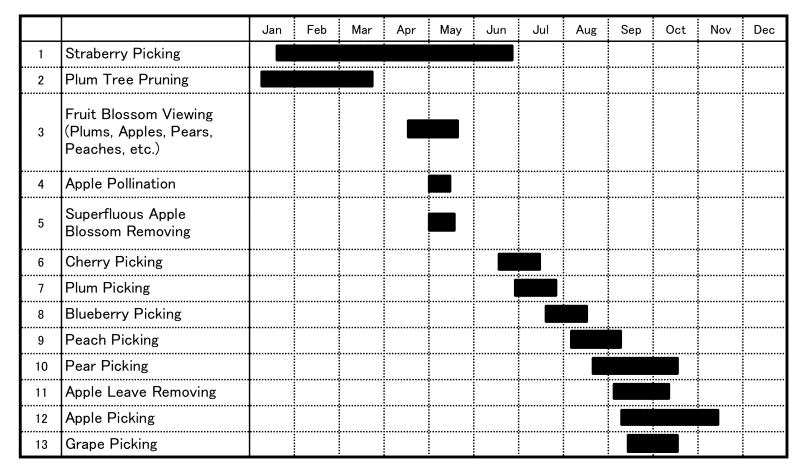 Besides the activities shown in the schedule below, other agricultural activities such as vegetable cultivation and harvesting are also provided by local people. Depending on the month, tourists can enjoy different kinds of agricultural experiences.